Bristlecone Pines are the world’s oldest living things. They have witnessed thousands of passing turns of the earth in the heavens—and, therefore, the stars turning relative to the earth. I feel awe and thanks that I’ve got to share this cosmic show from the Patriarch Grove high in the White Mountains in eastern California near the Nevada border. I shot this image while preparing for a workshop I was teaching in the Patriarch Grove. I positioned my camera to capture a north-facing landscape, and used an extremely wide-angle lens. The foreground was shot before it got fully dark at 1/250 of a second, f/8, and ISO 200. Without moving the camera on the tripod I waited until after dark and shot 35 images at 4 minutes, f/2.8, and ISO 400 to capture the stars. To render the stars whirling in the skies I stacked all the four minute exposures together using the Photoshop Statistics action, then blended in the foreground image to make the Bristlecone Pines and the details of the Patriarch Grove visible. For more about the Bristlecones and the Patriarch Grove see My Favorite Bristlecone and Distant Night Storm. The motorcycle shown in the monochromatic image below has been created by hand by Ian Barry, a true artist at what he does. You can click here to read my earlier story about the Falcon motorcycle. In much the same way, the creation of a digital monochromatic image is a matter of handcrafting—every step of the way from photography to printmaking takes care and attention to detail, and cannot be reduced to a formula. To create this image, I started by shooting for monochromatic High Dynamic Range (HDR). This image was created from seven exposures. Each exposure was shot at f/11 and ISO 200. I used a tripod, and manually bracketed the shutter speeds in a range from two seconds to 1/200 of a second. I combined the exposures to create a color image, then processed the color to black & white using twelve layers. The primary conversion tool I used was Nik Silver Efex 2, but I also used other conversion methods as part of this process. The key concept is to use Photoshop’s layers and layer masking to selectively convert different areas of the image to monochromatic using pinpoint control. Want to learn more about shooting and processing monochromatic HDR? 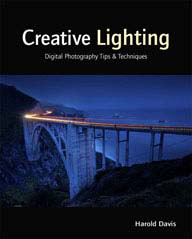 You can read my books Creative Black & White: Digital Photography Tips & Techniques and Creating HDR Photos: The Complete Guide To High Dynamic Range Photography or you can get it from the “the horse’s mouth”—that would be me! I am giving an all-day Black & White Masterclass on Saturday, November 3, 2012 here in Berkeley, CA. The cost is $195.00. Early-bird special: Note that HDR Bootcamp (Saturday October 6), Digital Black & White Masterclass (Saturday November 3), and Photographing Flowers for Transparency (Saturday December 1) are each discounted by $20 each until August 31, 2012. These three workshops are among my most popular offerings, I do not give them often, and I expect them to fill up extremely quickly in the next few weeks as word gets out. Please register now to avoid disappointment. What takes eight exposures, a tripod, and a range of 12 EVs? If you guessed a RAW exposure sequence manually bracketed for HDR (High Dynamic Range) with a strongly back lit window display of old bottles in a mock-up antique apothecary (with stuffed and dimly-lit shelves to either side) you’d be right regarding the image below. I shot it at the unique and wonderful Laws Railroad Museum near Bishop, CA. My eight exposures were shot at a 22mm focal length, an aperture of f/8 and an ISO of 200. Shutter speed durations ranged from 1/640 of a second to 2 seconds. Want to learn how to shoot and process this kind of HDR sequence in a variety of conditions and with a variety of subject matter? 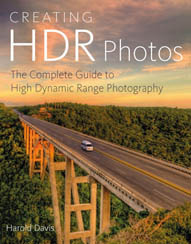 You can read my book Creating HDR Photos: The Complete Guide To High Dynamic Range Photography or you can get it from the “the horse’s mouth”—that would be me! I am giving an all-day HDR Bootcamp workshop on Saturday, Oct 6, 2012 here in Berkeley, CA. The cost is $195.00. This will be a hands-on workshop in terms of both shooting and processing. I will demonstrate my unique post-processing techniques that cannot be learned anywhere else. Click here for more information and registration. Early-bird special: Note that HDR Bootcamp (Saturday October 6), Digital Black & White Masterclass (Saturday November 3), and Photographing Flowers for Transparency (Saturday December 1) are each discounted by $20 each until August 31, 2012. These three workshops are among my most popular offerings, and I expect them to fill up extremely quickly in the next few weeks. Please register now to avoid disappointment. I am teaching Katie Rose to play chess. She gets the basic moves and is learning some openings—although she sometimes wants to jump all the pieces over each other the way the “horsies” do. Phyllis snapped this iPhone photo of the two of us playing. It is amazing for a four-year-old how much she concentrates! A bit over four years ago, the day my daughter was born, this would have seemed such a miracle. Phyllis and I have created many conventionally published photography books. Recently, we’ve become interested in the possibility of using new technology to create a hand made, limited edition art book, reminiscent of the botanical art of earlier centuries. You’ll find some of the details of our Botanique project below. We’ve turned to Kickstarter to, well, kickstart our project and help make it a reality—and if you are interested in our idea we’d greatly appreciate your support! We our half way to our funding goal of $3,000. If the rest of the goal isn’t funded in the next 64 hours then our Kickstarter project doesn’t happen. Project details: Botanique is an homage to the botannical art of the nineteenth century, and combines old and new craft and technology in the format of a handmade book presented on exotic surfaces. This project is conceived, designed, and fabricated by master photographer Harold Davis and well-known book designer Phyllis Davis. The 9″ X 12″ book features 12+ plates on surfaces such as vellum, Washi rice paper, and pearlized metallic substrate. One extradinary feature is the double-wide pull-out of one of Harold Davis’s well known floral panoramas on Unryu “Dragon’s Breath” Washi Rice paper. Botanique is presented in a presentation case suitable for display and includes a hand-signed and numbered colophon with information about the materials and processes used, as well as the edition information. The book is limited to 25 numbered copies (plus five artist’s copies). Click here to view the Botanique project on Kickstarter. Also, a very big thanks to those who have supported the project already—we are half way towards our funding goal for the project. We have less than three days to raise the other half of the original funding goals! I’ve done my best to answer the questions I’ve been asked below! Please check out Botanique—a handmade book of art prints by Harold Davis on Kickstarter. Feel free to contact me with comments, questions, and concerns. Go to the Harold Davis botanical art book Kickstarter project by clicking this link. Click the green Back this Project button on the right. You can pledge any amount starting at $1.00. I hope that the idea of supporting my botanical art and handmade printmaking appeals to you. I am also offering some tangible tokens of my appreciation for your support. These start at as little as $5.00. For example, a $100 pledge gets you a phone session with me that you could use for Photoshop tutoring (or other subject of your choice). There are a limited number of $500 pledges that get you a numbered copy of Botanique (see the question below for more information about the availability and pricing of Botanique). You’ll see a complete list of the rewards I am offering on the right side of my Kickstarter project page. Q: What if I’d like an incentive I don’t see on your Kickstarter project page ? Please contact me and we’ll see what we can arrange. Q: How will the book be priced after the Kickstarter project? We haven’t fully worked out the pricing of Botanique following the conclusion of the Kickstarter project—but you can be assured that we will never sell it for less than the pledge prices you’ll see on Kickstarter. As is customary in the art world, we intend to price earlier numbered copies lower than the later copies in the edition. Since the edition is strictly limited (to 25 numbered copies plus 5 artist copies) it is likely that the value will go up over time. At this point, two copies have already been committed in exchange for a $500 pledge. Via Kickstarter, there are 8 more copies available at the $500 level, 5 copies at the $1,200 level, and 5 copies at the $1,750 level. Q: When is the Kickstarter project over? The Harold Davis botanical art book Kickstarter project is over on Monday August 27, 2012 at 2:55PM EDT—less than three days from now. If the funding goal ($3,000) has not been reached at that point, no money changes hands. If the funding goal has been met, then your credit card will be charged the amount you have pledged. Your credit card will be charged on August 27, provided that the funding goal has been met. Credit card payments are processed by Amazon. Q: Does Kickstarter take a portion of the money I’ve pledged? Kickstarter takes a 5% fee and Amazon Payments takes another 5% fee of all pledges that are paid for a project that has successfully funded. Q: If I’ve sponsored you and am expecting a reward, how do I get my reward? Don’t you need my address? Provided the project is funded, address information for each sponsor is provided to us, and we will ship your reward to you (with my heartfelt thanks!). Q: What happens if your project raises more than the funding goal of $3,000? It’s all good because there’s no limit to the amount a Kickstarter project can raise. Some Kickstarter projects do raise more than their initial goal, and I’m hoping that my project will be one of these success stories (we’re only a few days into the project and off to a good start already!). Q: What about shipping rewards overseas? The pledge amounts for the tangible awards are based on shipping within the continental United States. If you would like a reward shipped outside the continental United States please contact us for the additional shipping amount, and then add the additional shipping charge when you make your pledge. Q: Where can I learn more about how Kickstarter works? You can “dip your toe” into the Kickstarter universe by pledging a small amount to my project (or to someone else’s project). Here’s a short summary of how Kickstarter works, and a link to the Kickstarter FAQ. About Kickstarter: If you are curious about Kickstarter, it is a “crowd-sourcing” platform for funding creative projects. Kickstarter is powered by an all-or-nothing funding method where projects must be fully-funded or no money changes hands. Some Harold Davis botanical images that will be in the art book: Check out Peonies mon amour, Red Poppies and White Irises. I’m excited about having my large botanical Washi prints in the Botanicals group exhibition at PHOTO in Oakland. The exhibit runs from August 23 through September 29, 2012. Note that a percentage of sales from this exhibit and at the opening will benefit the San Francisco Botanical Garden Society. Please consider joining me at the Artists Reception on Friday, September 7 from 6:00 to 9:00 PM and/or attending the benefit opening on Thursday, September 13 from 6:30 – 8:30 PM. Click here for gallery location and directions. Please also give some thought to my Botanique Kickstarter project, which only has a few days left to run. If you want to read the full review here it is in a PDF download. So I love and hate my iPhone. My iPhone 4 is the camera I always have with me, and it is a joy to schlep compared to my full and weighty rig of DSLR, lenses, and tripod. But sometimes it feels like my brains are in my iPhone, and my external brains are always trying to seduce me to be online—ignoring the beauty and serenity of the world in exchange for instant access to email no matter where I am. Whatever my feelings for my iPhone—and it is certainly a nifty device—I am not overly fond of Apple. I like apples, but Apple the company really doesn’t do it for me anymore. If you have to call yourself a “genius” then you are not one, and this certainly applies to the so-called customer service “geniuses” at Apple. The only thing they are geniuses at is making money for Apple. The other day the handset speaker on my iPhone stopped working. The phone worked okay with the ear buds, and when I pressed the Speaker button I could hear fine, but when I put the phone up to my ear and called, or someone phoned me, I couldn’t hear it through the phone. I tried cleaning the phone, rebooting it, backing it up and restoring the operating system, and so on, but nothing worked. I figured it was a hardware problem. So I made an appointment with the geniuses at the Apple store on 4th Street. Sure enough, my genius told me it was a hardware problem. All of the “solutions” the genius proffered involved trashing my phone and getting a new one. The cheapest “solution” was $149 for a replacement of the same model as my current phone, but the genius whispered to me that I maybe should “make do” without the sound and wait for the iPhone 5 to come out—I could then sign a new contract and pay to upgrade. To his credit, my “genius” did also suggest that I could probably get a repair shop to fix the problem for less than $149. Every “solution” Apple offered meant abandoning my current phone. Now, I don’t know about you, or about the average corporate warrior, but for me $149 is a lot of money to drop. The whole thing stuck in my craw. I figure my iPhone was made by slave labor in China. This thing was paid for in the currency of people’s lives. Also, if I paid Apple $149 for a new one they would probably refurbish and resell my old one, and further add to their multi-billion dollar hoard. So I took a pass on the $149 deal. You can’t even get cell phone service in the Bristlecone Pines (where I am heading to teach a workshop this week). Next stop: a repair shop. Yup, they said, we can fix this for you. Take about a week to get the part, though. Then I noticed “Joe” on Yelp with about a hundred 5-star reviews. I put “Joe” in quotes (the way it is on his business card), because almost certainly this is not his real name. Finding “Joe” was a little dodgy because his address seemed to be at Starbucks. When I called him, at first he was guarded until I described my problem with my iPhone. I asked where to find him, he kept repeating to me, as if I were slightly dense, “Come up the stairs inside Starbucks to the mezzanine, you’ll find me there.” Mobile office indeed! And yes, inside Starbucks there was “Joe” at a corner table in the mezzanine with his cup of “Joe”, unmistakable with two black briefcases, a black backpack, and iPhone tools in several Altoid boxes. “Joe” was surrounded by seven iPhones in various states of repair, and an extensive inventory of iPhone parts in tiny well-organized boxes. He took my phone apart in the blink of the eye, had the right part, tested it, and put my phone back together in about five minutes. All for more than the cost of a cup of “Joe,” but far less than a new phone from Apple would have cost. While I was there, customers came and called. He set up appointments, gave advice, and quoted prices. Busy guy. At one point “Joe” asked me to mind his shop while he delivered a repaired phone to a drive-by customer downstairs. So I don’t need no stinkin’ “Genius,” I’ve got my “Joe”—at least until I (possibly) switch to Android. If you have an iPhone that needs repair and you don’t want an expensive replacement from Apple, here’s a link to “Joe’s” site on Yelp. I found this wall of plumbing parts in the farming tool shed at Green Gulch where I was leading the Tao of Photography workshop. To make the image I shot five exposures with my camera on a tripod, which I combined in post-production using Hand-HDR in Photoshop and HDR Efex Pro 2 from Nik Software. Even though I tried to position the focal plane of the camera as parallel as possible to the cabinet of plumbing parts there was a parallax problem. The parallax issues were considerably mitigated in post-production using Photoshop perspective transformations so the image would appear “all squared away” (the title is in homage to the Gary Larson cartoon with this caption shown here in a physics textbook). To learn more about Photoshop transformations and their power, check out The Compositor’s Cafeteria on page 166 of my Photoshop Darkroom 2: Creative Digital Transformations. I am very excited to be heading back to the Bristlecone Pine groves of the White Mountains in California near the Nevada border next week. These trees, among the oldest of all living things, grow high in the desert mountain range east of the Sierras. They are very beautiful in their gnarled and twisted ancientness. Communing with nature in the Patriarch Grove of Bristlecone Pines is one of my favorite activities, and the tree shown in the two images below is one of my favorite trees among the Patriarchs. In fact, one friend of mine has claimed that I was “in love” with this tree. Certainly, I have spent much time gazing at it and waiting for my long HDR exposures to complete. One could certainly do worse in picking an inamorata! I am looking forward to leading a night photography workshop in the Patriarch Grove, and also of course pursuing my own work in this incredibly gorgeous landscape. You may be interested in some of my other stories on my blog about the Bristlecones, most ancient of all trees. Check out Seeking Methuselah; Touching the Rainbow; Distant Night Storm; and When Workshops Collide. If you are in the Southeast near Richmond, VA please keep in mind my full-day workshop. The cost is $60 ($72 with lunch) and the goal is to inspire you to creatively take your photography up a notch. Click here for information and registration. Since I wrote my story about our handmade botanical art book project on Kickstarter, I’ve had a number of questions. If you are one of the people who wrote me, I appreciate your interest. Great questions! Also, a very big thanks to those who have supported the project already—we are already more than one third of the way towards our funding goal for the project. The Harold Davis botanical art book Kickstarter project is over on Monday August 27, 2012 at 2:55PM EDT. If the funding goal ($3,000) has not been reached at that point, no money changes hands. If the funding goal has been met, then your credit card will be charged the amount you have pledged. Phyllis and I have created many conventionally published photography books. Recently, we’ve become interested in the possibility of using new technology to create a hand made, limited edition art book, reminiscent of the botanical art of earlier centuries. You’ll find some of the details of our Botanique project below. We’ve turned to Kickstarter to, well, kickstart our project and help make it a reality—and if you are interested in our idea we’d greatly appreciate your support!